Look at Raiders of the Lost Ark. Yes, it’s a throwback to old adventure serials and fantasy films, but it probably has more legitimate “frights” than most typical horror flicks. (Think of Satipo’s fate; or the entire Well of Souls sequence; or, Jesus, the big finale.) For all the wonder of Close Encounters of the Third Kind, it’s really just a couple of degrees removed from a horror film: We spend the whole movie wondering if the aliens are good or bad; if they turn out to be evil, the whole thing turns and Richard Dreyfuss suddenly starts to look more like a possessed person. Even E.T. : The Extra Terrestrial relies on its share of jump scares; at the time it came out, I remember legitimately being frightened by much of it. 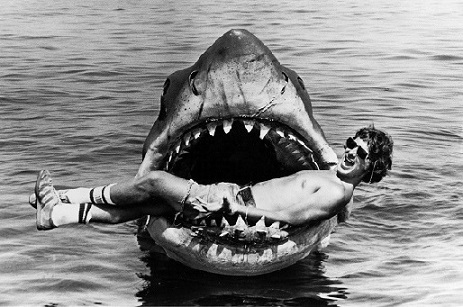 This is an element of Spielberg’s filmmaking that made quite an impression on me as a kid. But I’d forgotten about it in the intervening years. Seeing these films back then, for all the wonder and big emotions they inspired, I now recall that they also provoked a real sense of horror. A very safe kind of horror, to be sure: You jumped at E.T. suddenly popping into the frame, but you never quite felt the sense of helplessness and dread that you might in a proper horror flick. Obviously he’s not the only person to meld elements of horror into kid-friendly stories. There’s the example of The Brothers Grimm, after all. And one Walt Disney, who himself was a huge influence on Spielberg. But I do think Spielberg took it to another level, at times using the language of horror to tell non-horror stories. Spielberg would go to that well again: In the Jurassic Park films (especially The Lost World, which feels like more of a horror movie than the first one), in War of the Worlds, in parts of Minority Report. And while he hasn’t gone in that direction of late, take a look at this teaser for his upcoming Roald Dahl adaptation The BFG (scripted by the late Melissa Mathison, who also wrote E.T.). In light of his earlier work, it starts to come alive with possibility. Nice blog. Thanks for providing good info. Kala Jadu Specialist Aghori Baba/Baba Ji in Dehradun - According to the black magic specialist in black magic procedure, mantra remedy, tantra and totke is used. Your enemies are jealous of your success and in such situation you need to take help from Kala Jadu Specialist Aghori Baba/Baba Ji in Dehradun, aghori baba ji in ajmer ,aghori baba ji in ambala, aghori baba ji in amritsar, aghori baba ji in bangalore, aghori baba ji in bengaluru, aghori baba ji in bhopal, aghori baba ji in chandigarh, aghori baba ji in chennai, aghori baba ji in chhattisgarh, aghori baba ji in dehradun. Who will handle your enemies properly and will see that their evil eye do not have any influence on you. This procedure works positively for positive people and works negatively for the negative people. For this you have to take help from a black magic specialist who has deep knowledge in this field. With this a person will live his life in discipline and can have cure for all the problems.